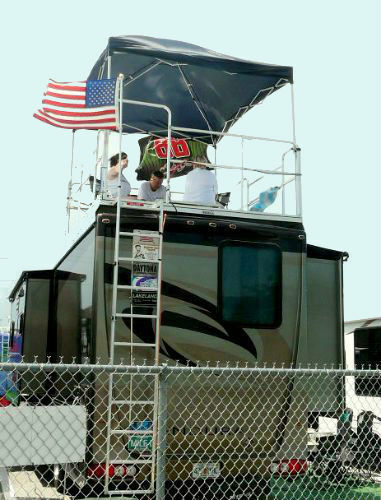 Every year, from February through November, thousands of RVers rev up their rigs and motor to NASCAR events across the country. From Daytona, Florida, to Watkins Glen, New York to everywhere in between, RVers plan way in advance to attend these RV-laden spectacles and take in the sport of speed. The grounds of the Phoenix International Raceway. Photos courtesy of the Phoenix International Raceway. While NASCAR is not for everyone (and to some, there is a mix of the good, bad and great of NASCAR RV camping), many attend for the sport and RV camaraderie that goes along with it. Although amenities are commonly nearby for basic supplies and food, RVers should prepare accordingly. 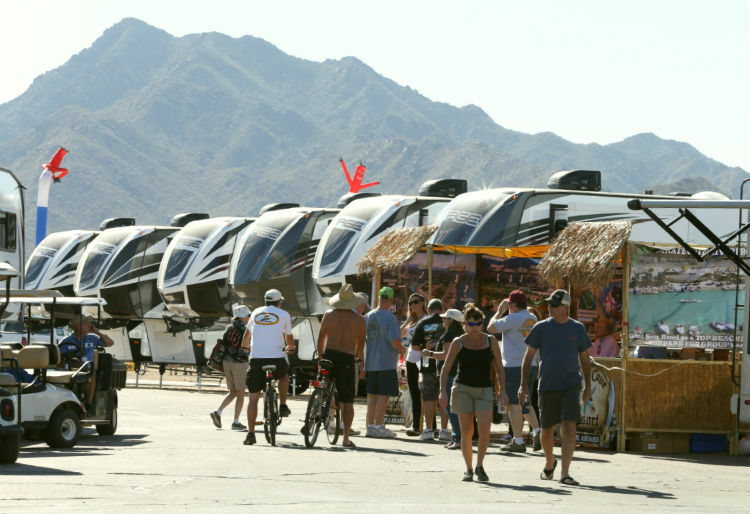 The number of RVs at an event is incredible. At the Phoenix International Raceway alone, the grounds have 3,000 reserved sites and 3,000 unreserved sites. Plus, there other campgrounds available in the immediate area. Unreserved spots are commonly based on a first-come, first served basis. In fact, Fresquez says it’s common in Phoenix for fans to start lining up their RVs two or three weeks in advance. So, book a reserved spot well in advance for any given NASCAR race. Although amenities are commonly nearby for basic supplies and food, you should prepare accordingly. There are several easy ways for great cooking on the road so bring what is necessary. You also need to be conservative with waste and grey tanks as many areas offer dry camping only, depending on the event. For instance, at Watkins Glen International—home of the NASCAR Sprint Cup—the sites vary. They range from full service (with water and electrical) to bare bones sites. Prices also differ, depending on your location, preferences, and budget. 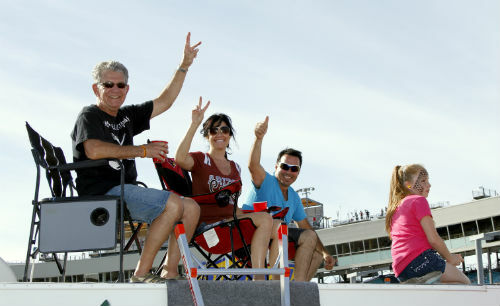 Is there a party atmosphere at NASCAR? 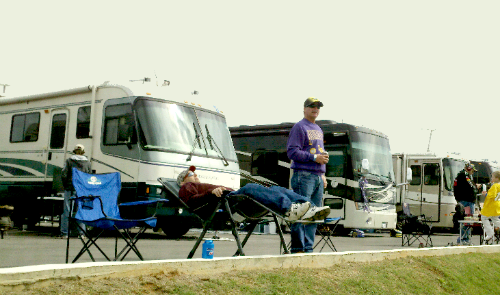 At any large event, be it an NFL game or a music fest, RV tailgating is a blast for many. NASCAR is no exception. If you’re not a huge party hardy-type, some tracks offer family zones and quiet hours. If you’re not a huge party hardy-type, some tracks offer family zones, quiet hours, and select times to run generators. Many RVers also opt for campgrounds off-site to meet specific needs. Aside from race weekend where speed, socializing, and tailgating reigns supreme, many events such as those in Daytona, Phoenix, Watkins Glen, Richmond, or Charlotte, to name a few, are great destination places to enjoy before or after race weekend. Many hosting cities offer many attractions and things to do and see. Chances are a new experience awaits around every race. Watkins Glen is the worst track for families. Too much drinking, open vulgarity, not for kids.Stay away. NASCAR is great to attend. I really enjoy going to Talladega.. The camping is free except on the infield. yes there are parties but I would take my grandkids with no problem at all.